GNOME: Sapper, are you alright? SAPPER: I think I've got vertigo. GNOME: Vertigo's not really a problem for me. And endless freefall however does affect my ability to function normally. I get butterflies in my stomache. SAPPER: I'm just glad we didn't have to play this map very long in order to write this review. GNOME: Because you didn't like the map? SAPPER: No, because I need to go to mom's house for some chicken soup. GNOME: I'm gonna skip the story today because I've honestly got nothing entertaining to tell to try to explain this one. It's just too unique. SAPPER: Unique...is that the latest euphemism for 'wtf'? SAPPER: If the architectual them is supposed to be a bottomless pit...mission accomplished. Falling endlessing while at the same time trying to grab weapons and ammo and shoot enemy targets in mid-aid who may or may not try to hide behind jump pads or else take off vertically while you keep falling has always been a dream of mine. GNOME: The theme and textures are good for what the author obviously had intended to build. However the screenshots we've provided have had the gamma bumped up a few notches just so you could see. It's a very dark map and, although characteristic of theme and something you'd expect in a bottomless pit, it does take away from the game. SAPPER: Unfortunately, this was the lowest score we can give. Despite the obvious design and gameplay flaws, non of that counts for the build. GNOME: The map was decently constructed. The author is familiar with zoning and movement effects. There are no structrual flaws. But there's also nothing interesting to note here so we'll move on. SAPPER: I should be noted to anyone who wants to give this map a try that they should up the air control to at least 50% if not higher. Otherwise, it'll just become frustrating as your falling to grab weapons and ammo while shooting enemies and dodging enemy shots. The higher your air control, the better the gameplay. GNOME: Weapon choices baffle me though. Because of the nature of the map, a weapon like the flak cannon is virtually useless unless you're making kills on the landings or ledges. The Shock rifle's second function is also virtually useless again unless you're on a landing or ledge. But camping in a map like this is not ideal, nor is it easy or fun. SAPPER: If not for the redeemer, this map would take alot longer than most people would probably want to play. GNOME: This map is an interesting choice to try out if your looking for something different or you want some freefall target practice. Beyond that, it's not much for looks and it's not much for gameplay. SAPPER: If you want my opinion, and everyone does, you'll pass on this one and wait for our next review. Trust me...you're seeing everything there is to be seen. NO don't "pass" on this one, small-ish file 3.18 meg. But I think it was an experiment and uploaded for fun, basicaly it takes mega skill to make kills on this map. 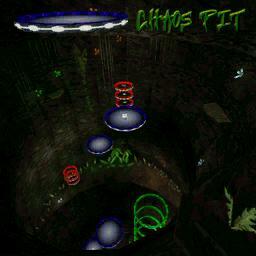 Download and see, total vertical play, allthough there are some ledges reasonably big, secret cave too !.You may want to increase brightness, it was meant to be dark, guided by the rings, and keeping track of where you are, tough map.